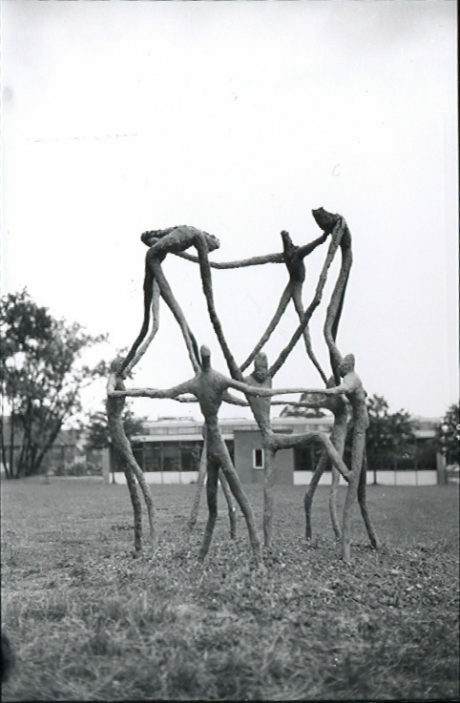 This sculpture, depicting tall, spindly figures in the act of creating what looks like a variation on a human pyramid stood in the grounds of Clarendon School. The photo was taken by the Watford Observer in summer 1962. We need your help! Do you know whose work this is, whether it is still standing and when it dates to? If you do, drop us a comment below. I can just remember the construction of this, I think it stood out side of the art block, I’m sure all the pupils had a hand in its construction, I’m sure I also had a hand in helping make it. For further information see ‘Modern Sculpture at Clarendon School – Part 2’. Mr Sellers also drew cartoons”Enoch and Eli” and went on a sabbatical to America returning with a rather exotic looking wife. Also, what happened to the Crusader statue? For some sad reason, I have a copy of the 8th annual prize giving and speech day report, November 29th 1962! Inside, as part of the art department report to parents, it says”…. group of figures entitled “The Acrobats”, completed under the supervision of Mr Sellers…” Looking at the staff list, I see Mr Hannabuss was the main pottery man, so he may have played a part….